LANDOVER, Md. 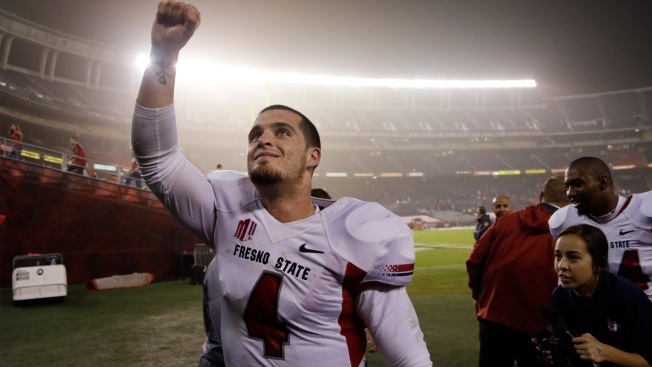 -- Derek Carr had a horrible, no good, very bad day at the office. The Raiders quarterback was uncharacteristically out of sync in Sunday night's 27-10 loss to the Washington football club, turning in one of the worst performances of his career. His first pass was an interception, and he didn't fare much better after that. He was 19-for-31 passing for 118 yards, a touchdown and two interceptions. He was sacked four times on a bad night for the offensive line. The Raiders offense was 0-for-11 on third down. Many played a part in this disaster, but Carr insists the blame only head his way. "I have to be better," Carr said. "Put all the blame on me. It's my fault. Everybody wants to pat you on the back when you win. You have to own it when you don't. Put it all on me. I'll be all right." Carr's stats have been worse only once. He had 117 yards passing in a Thursday night loss to Kansas City, but he didn't add turnovers to the situation. Carr had two against Washington. Montae Nicholson snagged an underthrown ball intended for Amari Cooper that set the tone for a terrible offensive showing. Washington scored a touchdown off that turnover and Carr's next pick, which came in the second quarter. "I mean, we've obviously seen him play at a real high level. Tonight wasn't one of those nights," Raiders head coach Jack Del Rio said. "It started on the second play of the game, and I think it just kind of unraveled from there. We didn't get a lot done with our offense and he's the triggerman, makes it all go." The Raiders didn't go far, only exceeding 100 yards of offense late in the fourth quarter. They didn't execute well on the ground or through the air, in stark contrast to the season's first two games. The offense got stuck in the mud. Carr says now the Raiders have to work their way out. "This isn't alarming, but we did get punched in the mouth," Carr said. "It's all about how we respond. We'll be ready to fight."